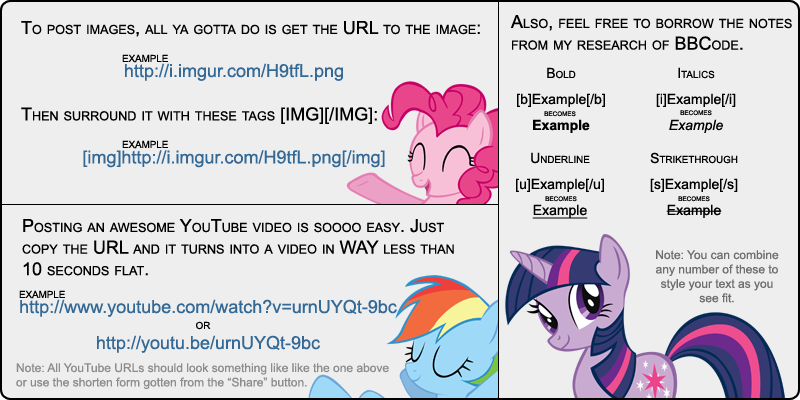 Check out BronyNet's rules list here. Be sure to review them at least semi-frequently, as they may change without notice. What are Ponymoticons, and how do I use them? Ponymoticons are pony emoticons! Like this: (/rdsitting) To post them, just type ­(/emote-code-here) into a post, comment, or chat message!. For emote codes and more information on Ponymoticons, visit its Reddit page. Find something that's not working? Check the BronyNet Twitter feed. I probably already know about the problem and will fix it ASAP. Why doesn't BronyNet support [feature]? BronyNet is in beta, meaning it's only just getting started. On top of that, I'm just one developer, and a student at that. I've put a lot of time and energy into this project, and I know it's lacking in certain areas. While suggestions are appreciated and encouraged, just bear in mind that with school, I don't have all the time in the world to work on this, and it can get pretty overwhelming. I'm just a regular guy who likes ponies. My Little Pony: Friendship is Magic is © Hasbro. All rights reserved. Running on Linux with PHP 7.2 and CloudFlare.